On the 13 th February 2014 we installed this sixteen module Phono 4kW solar PV system for Dr and Mrs L. of Smannell near Andover. We predicted an annual generation of 3500 hours per year using Enphase micro inverters with a twenty five year warranty and on-line individual monitoring capability. After exactly one year it has generated 3870 kW hours which ten percent better than our our original SAP calculation. 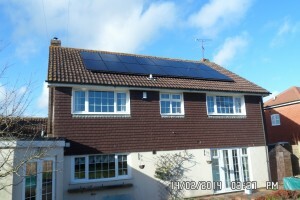 This installation also featured a solar iBoost which diverts over generation of solar power into the immersion resulting in other import fuel savings. This solar PV system provides a return on investment of over 13% per year on a twenty year contract which is index linked and tax free.